I don’t know why I titled this speechless, since I’m obviously not, but I just wanted to let everyone know about a friend of mine that takes pictures and she is AMAZING!!! Her name is Tarah Craft and you can view her work at http://www.inthebeginningphoto.com/. She took Tia’s 1 year shots and she took newborn shots of Landon and our family. I just looked at the proofs and, oh my goodness, they are amazing. I’ve been sitting here with tears in my eyes for 20 minutes watching the slideshow and wondering how on earth I’m going to narrow them down to stay in my budget. If you go into her site and click on Previews, enter the password “kstuart” and you can see the shots she took of us. She even managed to get a couple of great shots of Tia who was being a total pill that day and wanted nothing to do with having her picture made. Tarah, you are amazing! Thank you so much. You captured my children perfectly! My dear friend Tiffany sent me reeling into flashback mode with her post on New Kids on the Block. (Check out her blog at Quiet Gardens, Raging Seas!) Anyway, I had major flashbacks to my New Kid loving days. Alas, they were short lived, but filled with passion nonetheless. Now, my parents were nazi’s…uhhh, I mean, vigilant, about what my brother and I listened to. While other children sang and danced to Madonna and Michael Jackson, I rocked out to Leslie Gore and Sandi Patty. Somehow, though, the New Kids managed to slip through. Perhaps it was because our neighbor, Kirtie, who was in high school and babysat us occasionally was a New Kid FREAK. Seriously, she was the ultimate uberfan! Or perhaps they gave in and bought me a tape for the same reasons that I caved and let Sloan watch High School Musical – it was a harmless piece of pop culture and not worth the battle. Either way, I finally received the coveted cassette tape, which I promptly popped into my kickin’ Walkman and jammed to the tunes of Right Stuff and Please Don’t Go Girl. My childhood friend, Jenny, and I argued over who was cuter. She liked Joey, but I was partial to Jordan. He was my first celebrity crush. I’ll never forget going to Kirtie’s house the day after she went to their concert. She and her friend had tickets on the second row and she had so many cool, up close Polaroids. She also bought a concert video and I watched, jaw agape, as Jordan spun round and round on his shoulders. Kirtie gave me an oversize button, which I pinned on my tubular jean jacket and wore to school the next day. During recess, my friends and I stood in a semi-circle and compared buttons. I remember Alyssa Rohl had ten buttons, some small and some big. She had an awesome hat where she pinned two of her buttons. It was wicked. My other friend Kristen had a swatch watch imprinted with a picture of the boys. We talked about how sweet Joey was and how cool Donnie was with his happenin’ half mullet. And we all agreed that Danny looked a little like a monkey. There we stood, our hair crimped, french braided and teased, our conversation peppered with “like,” and “totally,” and “oh, gag me.” We were the stuff. To illustrate this story, I thought I would include a picture from those days. Unfortunately, I don’t have many old pictures here at my house, these were all I could find. 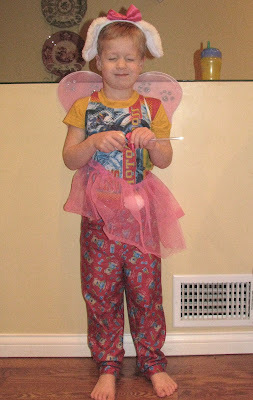 But, you’ll see I was totally fashion forward. The only fashion trend of that day that I passed up was the massive bangs. I wisely realized very young that I looked like a dork with my bangs like that. Not that I didn’t give it a good effort. 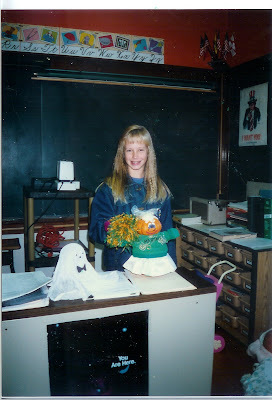 While the other girls walked around looking like their forehead froze mid-projectile-vomit, I opted for simpler bangs, but rocked out the side ponytail and was a genius with a crimping iron. Now, of course, these pictures I’m showing were only from fifth grade, when my parents still exercised a good deal of control over my fashion choices. Later on, when left on my own, my choices in haristyle were far less tame. While I couldn’t get away with my bangs in full out bloom, I did try to curl and spray them in various ways. You know in the movie What About Mary when Cameron Diaz’s bangs are standing straight up, as though somehow she ran into a wall? That’s what I usually ended up looking like. If I find such a picture and have the guts to subject myself to that humiliation, I will post one. 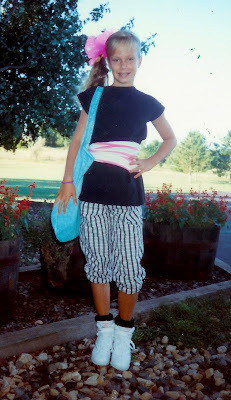 For now, enjoy the days of Units belts, Esprit over sized bags and crimped hair. Thanks, Tiffany, for the walk down memory lane. It’s been a good ride! A better day. Landon slept really well last night, Sloan was in school until 3:00 today and my AWESOME neighbor, Carol, kept Landon so I could go to the grocery store. Thanks again, Carol. All three kids went to bed early and I relaxed. I just watched Jon and Kate Plus 8. Do any of you watch that? It’s on TLC on Monday nights. You should watch it – it’s great. It makes my three kids look like a walk in the park. Tia climbed out of her crib twice today. I think we’re going to have to transition to big girl bed soon, which I wasn’t quite ready for but I don’t want her to hurt herself. We’ll see. Now I’m off to bed. I may actually be asleep before 10:00 tonight! Woohoo! 5:00am – Lee gets up and gets ready to leave for Michigan for the week. Landon also gets up and decides that he doesn’t want to go back to sleep so instead he grunts and groans for an hour and a half. 6:00am – I am near tears as I look at my six week old son who is in desperate need of a good poop. I curse my lack of milk production which requires my kid to try and digest formula. 6:30am – Sloan and Tia both wake up and I bite my tongue not to scream a curse word. They both went to bed at 10:00 the night before because we had a party, are you freakin’ kidding me??!?! 7:00am – I reluctantly drag myself out of bed (Landon finally fell asleep…of course) and get up and make the kids breakfast, then stick a movie in and curl up by the fire. We can’t go to church because Tia has another cold…awesome. 8:30am – Tia, who has only been watching the movie for about 15 minutes, drops a carton of eggs that I carelessly left on the counter on the floor. I again bite my tongue and clean up the mess. 9:00am – Landon is screaming. Seriously, he needs to poop. I give him apple juice. It doesn’t help. 10:00am – I bundle the kids up and plop them in the car for a drive to Target to buy suppositories for my now inconsolable child. Landon screams most of the time we’re in Target. But Sloan and Tia are extremely well behaved because I bribe them with a piece of gum when we leave the store. Score one for mommy. 10:53am – I insert suppository. 10:54am – I pray to God that this works so I never have to do it again. 10:55am – I curse my lack of milk once more. 10:56am – Landon finally poops. Hallelujah! 10:57am – He’s still pooping. 11:00am – put a fresh diaper on him and lay him down. He promptly begins screaming. I calmly close the door and turn a deaf ear. I check on the other two who are outside. They’ve got hammers and are massacreing (sp?) the tree in the back yard. I turn a blind eye and make lunch. 1:00pm – I finally have everyone down for naps. Wait…nope, Landon’s awake again. No nap for mommy. 6:00pm – After a relatively mild afternoon of playing outside, we leave for the Magic House for a fundraiser for Sloan’s school. My good friend Kara helps and praise God. I would have lost one of the children without the help. The Magic House was great fun, except Landon cried most of the time. It was hot and loud. But the other two had a ball. We took Landon to the dr. yesterday and he weighed 11 pounds! That means he’s gained 3 pounds in a month…he’s not afraid. I’m really surprised because he is not a big eater. I guess he just holds on to everything he eats. He was 21.5 inches long. Which only put him in the 50% for height and the 90% for weight. So he’s short and fat…Just to give some comparisons – Sloan weighed 12lbs 13 oz at the same age as Landon and was 23 3/4″ long – he was ginormous. Tia, on the other hand was only 9 lbs 7 oz, but was 22″. So Landon is kind of right in between him. Those facts are probably not interesting to anyone but me but thanks for reading anyway. This morning I cleared a huge hurdle…I got all three kids up, fed and ready to go in time to take Sloan to school. I then went to the gym and walked with Landon in the Baby Bjorn for 30 minutes, then took Tia and Landon to the mall so she could play until it was time to pick Sloan up. I got them all home and fed them and got them all down for naps. Who said three kids were tough?! I did all of that and only lost my patience one time (if Sloan asked me again if he was putting his shoes on the right feet, I thought I would scream. Just put them on!!!) So, this is just me, publicly patting myself on the back. I survived! YEAH! 1. I adore my husband. I think he’s hilarious. He truly makes me laugh all the time. He’s funny when he’s not trying to be. We always tell each other what geeks we are, and it’s true. We’re dweebs. But we make each other laugh despite that fact. 2. Lee’s a great dad. He is so involved with the kids. He is always willing to give me some time off, to let me go out with friends or just get out if I need a break. He doesn’t put any guilt on me for leaving him with the kids. I love that. He takes on a lot of responsibilities around that house, which I am so grateful for – especially now! He wrestles ith the kids and plays with them and they truly adore their daddy. 3. Lee loves the Lord. On eof the things that I’ve alwasy admired about him is his knowledge of the scriptures. He knows the Bible and can defend his faith. He desires to lead our family spiritually and prays with and for the kids and me faithfully. He really is the leader of this home and I’m grateful for that! 4. Lee is a great businessman. When we met and got engaged, he was a youth minister and that was how I saw him. After we got married and he entered the business world, I was astounded at what a good businessman he was, and I’m still amazed. He is wise and confident and makes good decisions. He’s not afraid to take risks (even though that goes against his nature). He is the physical provider for our family as well. He’s awesome! 1. I love Sloan’s personality. He’s so funny and fun. He’s outgoing and from the time he was a baby has never met a stranger. He’s always ready to make a new friend. He loves people and is so sweet. 2. Sloan loves to be a helper. He loves to clean the bathroom for me (which consists of nothing more than shoving everything off the counter into the drawer) and is so proud of himself when he does it. He knows he’s helping me and that brings him great joy. I love that about him. 3. Sloan is just funny. He says funny things and does funny things. He is a mimic, like his mama, and can do funny voices and funny dances. It’s so fun to watch him grow and develop with each passing day. 1. I truly never expected to have a little girl and would have been perfectly content with all boys, but oh how I cherish this little girl! I adore her precious little face with her big eyes and chubby cheeks. I am madly in love with her. 2. Tia is developing into a little character like her brother. I love to watch her follow him around and mimic him (I kow it drives poor Sloan crazy though). She literally does everything that he does, almost exactly as he does it. It’s hilarious. 3. Tia is very sweet natured. She does not like to see people upset or crying. She is a snuggler and hugger. I love watching her interact with Lee. She snuggles up on his lap and I can see him turn to mush. I love watching her become more motherly with her baby dolls. It’s so sweet. I don’t know much about Landon yet. But I kow I’m in love with him. I love the way he turns his face into my neck when I’m holding him so that his chubby little cheek is right up against mine. I love how he looks up at me with his big sweet eyes while I feed him. I love they way he is moving his little mouth around, trying to figure out how to stretch it into a smile. I’m excited to see what his personality will be like. So that is my precious family. They are all unique and darling and I feel blessed beyond measure to have each one of them!